This is an editor for the Korg 05R/W. 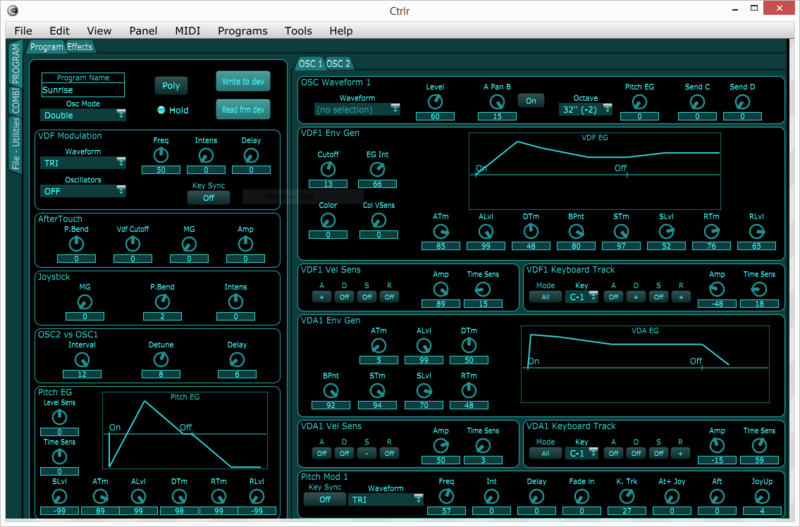 Almost all the editable parameters are supported, as well as load/save of sounds from/to sys dumps. Thank you very much for your work and sharing with us! This editor is fantastic! Amazing work – interactive graphics on the envelopes, sending and receiving programs from the unit works and it is otherwise 100% awesome. Finally, I get to dig my hands deep in the 05R/W without deep menu diving. Thank you! Great work, can it also be use with a X5DR ? Hi, I´m new here, and I don’t know how can I use this editor with my Korg. Windows cannot open .bpanelz files… What I need to use it? Thanks. Good day Mdeca. Thank you for this panel. It looks fantastic! I own a Korg X3, and since it is similar to the Korg 05R/W, I TRIED to use this panel with my Korg X3, but alas! It keeps on saying “Invalid MIDI Device”. Is the SysEx data for Korg 05R/W not similar to the Korg X3? Is there any chance of updating this panel to make it compatible with the Korg X3? In any case, thank you for all the hard work and this beautiful panel. I know a lot of Korg 05R/W owners appreciate this! Can I edit my 05R/W with your software just using a regular midi to usb cable to connect it to my Windows (10) PC? Or do I need a to-host cable and some kind of adapter? I have successfully connected my other keyboard (Roland) to my Windows 10 64bit PC without any problems whatsoever! I run another CTRLR Panel with that keyboard, and it works 100% I just cannot get my Korg X3 to work with this Korg 05R/W panel (not surprising since it is NOT a Korg 05R/W). I am using a Chinese USB to MIDI cable, and when I plugged it into my Windows 10 64bit PC, Windows 10 automatically loaded the required drivers (I did not use the manufacturer outdated drivers). So I suggest that you use your USB to MIDI cable, and ensure that it appears successfully in the Windows 10 Device Manager. 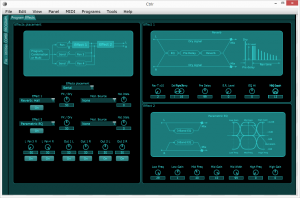 Then download and install CTRLR (I recommend version Ctrlr-5.4.29 which is very stable). Then run the software and load the panel, and everything should work perfectly (if you have a Korg 05R/W)! I’m just setting everything up using my USB to MIDI cable, as you suggested – and it seems to be working fine! I haven’t really started editing sounds yet, though, so I have some work to do getting acquainted with the editor. Hello everybody and sorry for answering so late. @RaymondInSA: at the beginning of every SysEx message there are some bytes that identify the brand and model of the synth sending the message, and the editor checks that and responds only to those coming from a 05R/W. If this is the only difference with the X3 (which I doubt), try to bypass this check – have a look at the function “midiParseReceived” around lines 39-43. Do you think it will work with my Korg 03R/W please? Its in the post (the Korg 03R/W) on its way to me and if this is compatible i will be a very happy girl!